With more and more manufacturers getting on the Fat bike bandwagon in the last few weeks, at On-One we're happy to be pushing ahead with new projects of our own. When the world seems to be dominated by people making bikes with slightly different tyre sizes, we thought we'd make a move in the right direction and open up a new area in the Fat bike market - with our 24in wheeled, 12in framed Baby Fatty. Designed from the top down (it's the same as designing from the ground up, from front to back, or from a plain piece of paper, and really is just a phrase companies use, rather than a process) we did the radical step of "making the wheels smaller" and "making other bits smaller too". Joking aside, it's a 24in wheel with a 4.0in tyre, fitted on a smaller 12in frame, with shorter, lower, etc geometry, a new unicrown fork, new 44mm headset, but all the same quality of manufacture that our full size Fatty has. Priced at around £800, this is a premium product, which features the same CNC hubs, same 6061 T6 hand welded frame, same SRAM X5 components. 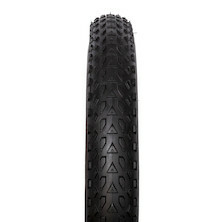 The On-One Fatty has been our best selling mountainbike of the year so far with over 500 units sold to date. We're currently offering a "rolling chassis" kit of frame, fork, wheel and tyre set, for just £499, allowing handy people to build their own Fatbike with parts they have lying around. Complete grown-up adult size Fatty bikes retail from £999. Baby Fatty is set to appear in early November. It's the essential Christmas gift.